Eric Rodawig started today as the chip leader by a fair distance and then never once relinquished the top spot. He was always above everyone else and even when he suffered a slight dip during the final table, he kept his nose in front of the rest of the field. With 18 players coming back today, it was a quick jump into the money as it took less than 10 minutes for Jon Turner and Justin Smith to be eliminated having turned up for three days to take home no money. Cyndy Violette, Erik Seidel and Phil Laak all made the money while unlucky Frenchman Antony Lellouche was to be the bubble at our final table. Ali Eslami was first to be knocked out of the final table having been the short stack coming in. Joe Tehan was next, despite managing to fold a full house on sixth street correctly, he got chopped up in one pot to leave himself dangerously short and busted disappointingly in seventh place. 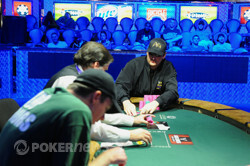 Phil Hellmuth was the shortest for much of the six-handed play, managing to find several double ups to bring himself up the leader board. Russian Mikhail Savinov, a limit-game specialist was next to be eliminated, followed by David Benyamine - another deep run for the Frenchman but he will have wanted another bracelet. Four-handed saw Ted Forrest go from second place to virtually out when he called every street against Rodawig, only to muck when he was shown a simple pair of aces. Forrest then got scooped by Hellmuth soon after and ended up going out in fourth. Three-handed play between Hellmuth, Rodawig and John Racener continued for an extended period of time but Rodawig always stayed in control as the other two vied for second position. Racener eventually lost out after losing consecutive significant pots to first Rodawig then Hellmuth leaving us with our heads up battle. All eyes were on Hellmuth, but he faced a mountainous climb and was unable to get there, all in several times before finally Rodawig was able to scoop his man and win his first bracelet - the $10,000 Seven Card Stud Hi-Low Split-8 or Better Championship! 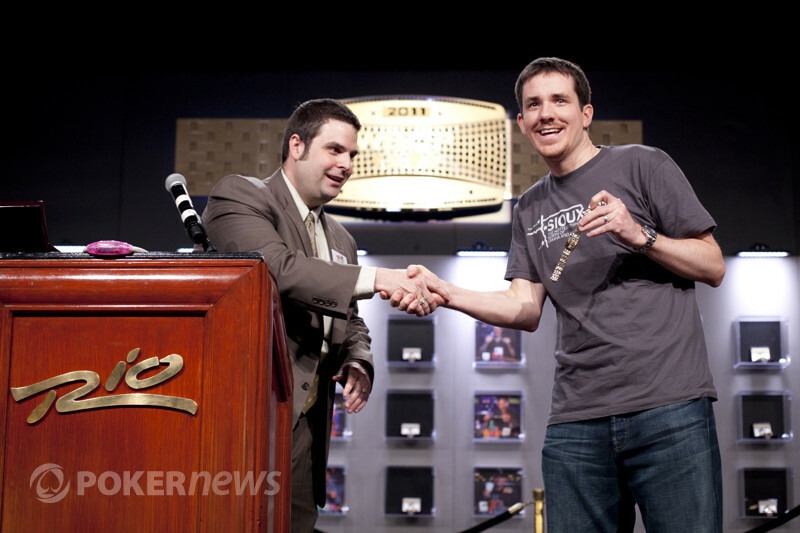 After Eric Rodawig brought it in and Phil Hellmuth completed, Rodawig raised. Hellmuth got it in for 280,000 and Rodawig called. 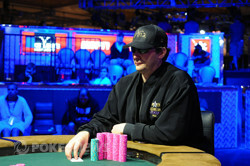 Facing Rodawig's two pair, Hellmuth was left with only three outs to keep his hopes for a 12th WSOP bracelet alive. 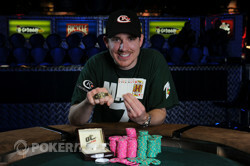 The wasn't it, ending Hellmuth's run in second place for the second time this WSOP. Hellmuth was gracious in defeat, telling Rodawig, "You played well." He received consolation from friends Huck Seed and Jean-Robert Bellande as the crowd gave him a rousing ovation. Phil Hellmuth was all in again with queens but was in trouble when Eric Rodawig made aces on fourth, Hellmuth hit a second pair on sixth and somehow Rodawig completely missed everything allowing Hellmuth to scoop. Phil Hellmuth was all in on third and managed to make aces and an 8-6-4-2-A, Rodawig couldn't make anything and Hellmuth doubled back up. Rodawig had the bring in and Phil Hellmuth called, both checked fourth street before Rodawig fired fifth, sixth and seventh. Hellmuth called down but couldn't beat his opponent's for trip threes. Phil Hellmuth was all in by fifth street and ahead against Eric Rodawig but the latter pulled out a queen on seventh to make a straight. 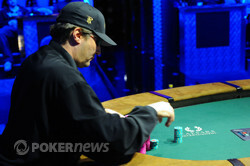 Hellmuth now needed to make a low or full house otherwise he'd finish in second place. He picked up the and it was back to the battle. Hellmuth was all in by sixth and showing and picked up the on the seventh to scoop as Rodawig flipped for only a lowly pair of fives. Hellmuth is back in this. Phil Hellmuth defended his bring in. Eric Rodawig bet fourth street, quickly getting raised by Hellmuth. Rodawig called, but then check-folded on fifth street.